Providing you the best range of customized signage with effective & timely delivery. 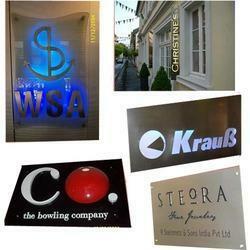 We are the leading manufacturers of all types of Customized Signage. The varieties include designing the signage with innovative ideas making the use of methodologies such as laser cutting, CNC router cutting, CNC engraving, Placement of LEDs with digital print or PU coated letters. We work with leading architects and bring their ideas in reality with our perception and perfection. Our expert designers and engineers suggest you the right choice of signage which will compliment your decor and budget. Looking for Customized Signage ?